I just finished my morning glass of carrot-ginger juice and realized this is one GAPS staple I haven’t told you much about, even though it has helped my digestion so much! To juice, you need a juicer with a filter, or a heavy duty blender and something to strain your juice with. If you don’t want to make the investment in a juicer without trying it first, do like we did and ask your facebook friends! Lots of people try juicing and then don’t stick with it. I must admit, our family has been pretty lazy about juicing. Even though we like vegetable juice, it’s one more thing to do that doesn’t always get done. But I’m the best out of everyone at remembering to juice… because if I start to get a little constipated I remember what makes me feel better! No… it’s not the fiber! On the GAPS diet, you actually start off with almost no fiber at all. The juice we use from Intro Stage 4 on is filtered. We compost our pulp, but some people use them as a base for raw food dehydrated crackers. I want to try that someday! If pulp makes it through your juicer into your juice, you are to strain it further! When your gut is damaged, it makes getting the nutrition from your food difficult. 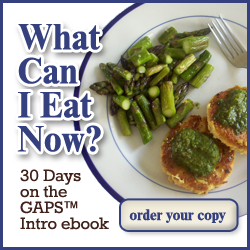 So the GAPS diet focuses on the most nutrient dense foods. When you juice, you concentrate the nutrients so that your damaged gut doesn’t have to do all the work of extracting them from the fiber. You get the nutrition without the work! For people who don’t like the texture of vegetables, or who don’t like drinking plain water, juicing can be a good way to boost both liquid and nutrition in the diet. Juicing isn’t meant to be the only way you consume vegetables on GAPS. To the contrary, we eat loads of whole vegetables as well! On the GAPS diet, you drink your juice first thing in the morning, or a couple hours apart from meals. It is a detoxing drink, and it also gets your body ready to digest your food. According to Dr. Natasha, it stimulates stomach acid and pancreatic enzyme production, and is cleansing to the kidneys. Cabbage-celery-apple juice is recommended in the book for kidney cleansing. The combinations of vegetables and fruits you can use in your juice are endless. Of course what you choose to include will determine what nutrition and detox properties you experience! The easy, inexpensive combo I use most often is carrot-celery-apple-ginger! Do you juice? What is your favorite combination? This post is part of Sunday School, Monday Mania, Fat Tuesday. Just love plain carrot juice! So delish! Also spinach, Kale, apple, and lemon. Super delish! After reading the list of suggested vegetables, I felt the need to share this article from The Healthy Home Economist about certain vegetables to not eat raw. This was new to myself as well, but seems to make good sense. “Cruciferous vegetables should be cooked before eating as they contain chemicals that BLOCK the production of thyroid hormone in your body”. I agree people who struggle with hypothyroidism or similar issues may want to watch out for cruciferous veggies. On the other hand, I have a friend with Grave’s disease who needs to eat raw cruciferous veggies every day. We’re all individuals! My thought is that foods have many properties and our bodies have their own particular imbalances. While Dr. Natasha does not recommend uncooked veggies at all for much of the intro, she does recommend juicing the ones on the above list for their cleansing properties. I think it’s probably a balance each person needs to figure out on their own and with the help of their health care practitioners. You are right, we are all made up differently, that’s for sure! Most often I use celery (over 50%), kale/parsley/cilantro, 1/2 carrot, cucumbers and zucchini if I have it on hand…than your blood sugar stays stable…easier on your gut. Thank you for reading and commenting! We do not make batches of juice to store, we just make it fresh every time and generally just have it in the morning. I haven’t seen actual studies on it, but rumor has it that as the juice oxidizes it becomes less nutritious within a few moments. My opinion is that as long as it still smells and tastes fine, it’s not going to hurt you after being refrigerated over the course of a day. It just might be missing some of the benefits. Here is an article about storing fresh juice. I’ll keep my eye out for more information on this, and would love it if you’d let me know what you find out and what your experience is! I love carrot/celery/romaine/cabbage/a bit of beet/ginger/tart apple and mint. I’m on Intro and I usually juice first thing in the a.m. and then in the late afternoon and I add GAPS sour cream to my juice to counter act blood sugar spikes. I really look forward to my juice! I was wondering if you peel&de-seed the veggies/fruits that go into the juice? Thanks. I usually just wash thoroughly.